I should really call these posts "Snaps from the weekend" because the majority of the photos are screen shots from my snapchat. Should I change it? Let me know! Friday morning I took my workout to the mall with my Stroller Strides crew and decided to have a treat yo self moment and pick up an Apple watch. I went back and forth between the 38mm and the 42mm size for a good thirty minutes before deciding bigger IS better. The remainder of the day was spent working while Eddie tackled more of his attic project. Saturday morning I HIIT the gym (see what I did there?) and put my watch to work for the first time. I actually wore my Polar on one wrist and my Apple watch on the other, just to test the accuracy. I am thrilled to report my burns were almost exactly the same, they were slightly higher on my AW but I'll take it. After Molly woke up from her nap we piled into the car and head out for our "family errand day." First stop was BJ's for formula, which I cannot wait to stop having to buy every two weeks, and then Walmart for wreaths. I was inspired by a late night (9:30 pm) instagram scroll to put wreaths in every window in the front of our home. Although the photo is a little dark because the sun was setting when we finally finished, we are really happy with the outcome. Eddie wants to get a larger wreath for our middle window but I think keeping them all the same is the way to go, if you have an opinion or suggestion please leave it below! After Walmart we went to lunch, something we rarely do anymore but it was a nice way to break up the day. I didn't take pictures of our meals but I did capture Molly's mess. I wasn't paying attention and emptied the dust from her yogurt melts all over the table. Don't worry, I cleaned it up! After lunch we stopped at A.C Moore to pick up crafting supplies for Gigi and Molly to work on this week for Christmas gifts. Then we made it to our final destination, Bath & Body works for their $8.50 candle sale. On the bottom left is "winter rose," I found this one on our way out of the store and quickly swapped it with another I had in my bag already. I am kicking myself for not buying more of this one! 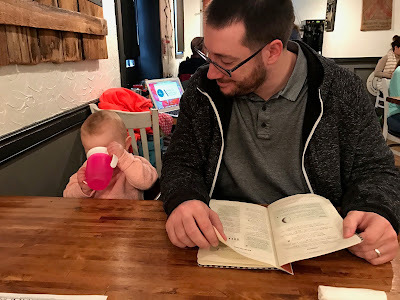 Sunday we adventured into downtown Annapolis for Eddie's first time at the Iron Rooster. The wait for a table was 35 minutes but we bumped into a few friends who were also waiting so it made the time pass much more quickly. One thing the Iron Rooster is known for is their homemade poptarts. They always have brown sugar and mixed berry on the menu then one specialty tart which on Sunday was oreo. We both found it to be very disappointing but the brown sugar, my all time favorite, was just as perfect as ever. After lunch we did our weekly food haul at Trader Joe's, what we gained in food we lost in socks. Every time we go food shopping Molly loses a sock, it has gotten to the point the people at Trader Joe's know us because of this. All in all, we had a fantastic and busy weekend. Definitely larger wreath for the middle window!